Due to the popularity of high power LED, it has become a trend that using single or a few LED as light source, helped by Fresnel lens and microarray lens as luminous body, to constitute a traffic signal lamp, instead of multiple LEDs as light source. 1st: with few LEDs, simple structure and reducing cost. 2nd: the concentrating effect of Fresnel lens makes the signal light more penetrating, which is more suitable for bad weather, such as fog and haze. 3rd: Fresnel lens can enhance the utilization of LED light and has the signal lamp get higher light efficiency and visual angle. 4th: Fresnel lens ultra thin structure, large size, arbitrary shape cutting, and excellent light transmittance, which are better than the traditional geometric convex lens. It can be used in many occasions with its light weight less than the convex lens. 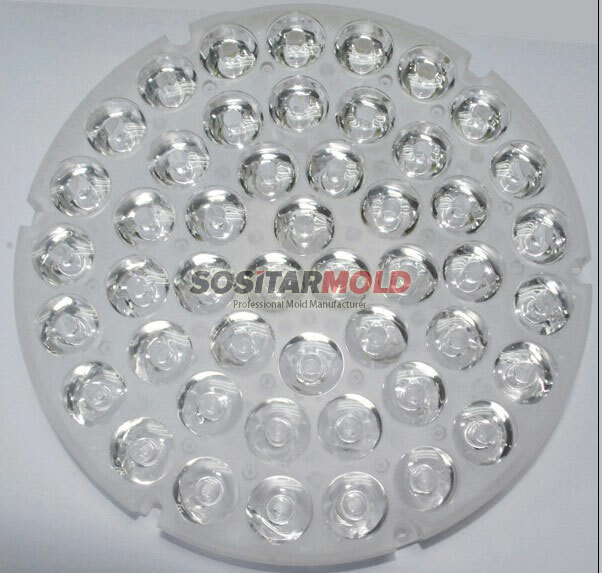 we are the lead optical plastic parts mold supplier in past years,make about more than 50 sets of clear plastic parts molds per year.Nowadays people become to love the transparent plastic parts instead of glass parts,the main reason have :as the technology develop in past year,transparent parts made by injection molding become cheaper and cheaper,the defect such as bubble and sink mark already is not a issue at all. another reason,the plastic parts are durable.not easy to break.now our company invest lots of money to found a non-dust shop only to produce clear parts. 4. Your inquiry for our products will be replied in 24 hours.